Dom and I made the adventure down to Lake Tawakoni in Texas for the Cabela’s King Kat tournament. Pre-fishing on Friday, we really wanted to establish a pattern that we felt would hold for the day of the tournament. We started graphing mid-depth water close to channel edges to get an idea of what the bait was doing. We marked lots of bait, what appeared to be threadfin shad along a 20-30ft flat. It was very thick with scattered catfish all around. The bait was not broken up, so they weren’t feeding catfish. We took note of the situation and moved on. Next, we wanted to check on some shallow water options that are usually good this time of year. However, after checking, we didn’t see much shallower than 16ft today. Next, focus on break lines close to the deep fish and bait we marked looking on the down wind side. We found some active fish on a break from 30ft of water up to 14ft. We anchored up and caught a few. After those bites we left. Don’t want to wear out an area. Up and ready! Launched and headed to the area we left fish biting the day before. 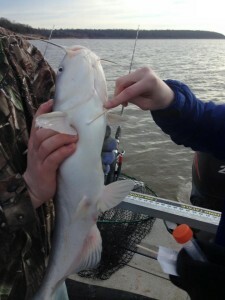 We marked lots of feeding blue catfish!!! Anchored up and began the long wait for time to begin fishing…long wait. 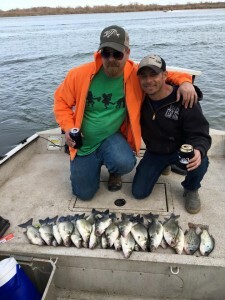 Tournament begins and we get the lines out with much anticipation….however, after over an hour of waiting with lots of bites but no takers, we begin talking about our next move. Next move, was some shallow water in the area. We marked some good fish, but not takers. Next move, timber. Caught a couple small one’s. Next move, drag a mid depth flat on a channel. 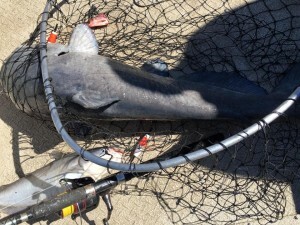 Caught another small blue catfish. Next move, drag a deep flat. Caught another small one. Next move, switch areas of the lake and looked at a variety of areas and depths. We didn’t find anything we felt would win a tournament. Next move, go shallow, really shallow. We went to the very back of a flooded area and fished the grass. We managed to put a 15 pounder in the boat and another couple of small fish. Unfortunately, we ran out of time to get a couple of big fish. We had a blast seeing old friends and fishing against some of the best catfishermen in the world. The bite was poor for everyone and has been poor all winter. We never got the cold snaps we needed to send the fish into winter feeding mode. We look forward to competing next year! Fishing the Spring River on Grand Lake for white bass with new customers, Adam and Nate. We got an early start this morning trying to beat the crowd and get an early bite. We beat the crowd, but the fishing was fairly slow the first couple of hours. We were catching, just not very quickly. 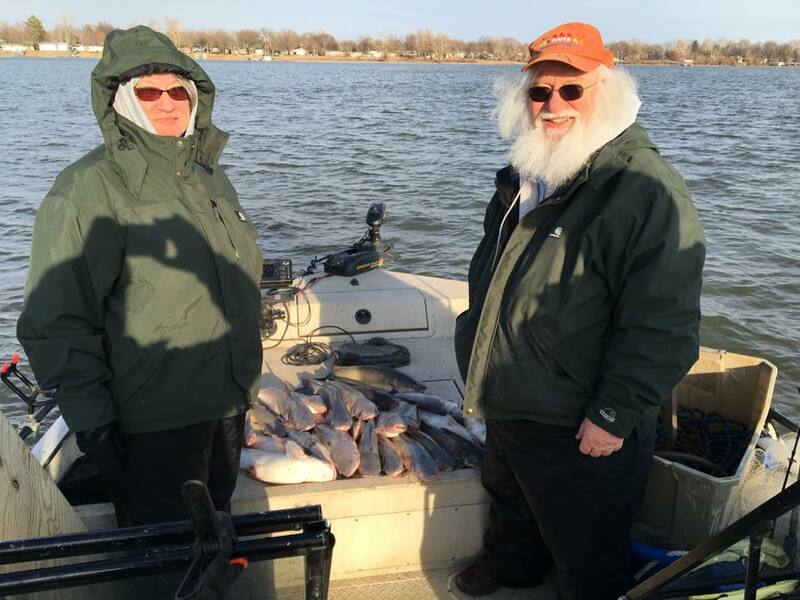 A little before noon we finally got on a steady pattern and consistently put fish in the boat. Slow rolling GoGo Minnows from Fle-Fly on the mud line created from all the boat traffic wakes was the ticket. The waves crashing against the mud bank creates a mud line about 10-12 feet away from the bank. The white bass use this for ambushing their prey. We would work the bank throwing both pearl and chartreuse 2.5″ GoGo Minnows on 1/8 ounce head on a double rig using 8 pound test line. We would cast it near the bank and begin slow rolling, slow enough the lures were ticking the bottom. Sometimes they would just nail it…other times, they would hit it several times before your rod would load up. If they are just lightly hitting it, just keep working it until you feel a steady pull and set the hook. We didn’t spend much time fishing for crappie, but the ones we did catch were pretty good fish. We would cast over a brush pile and slow roll it over the top. 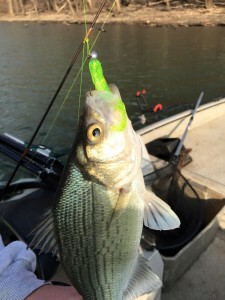 Same lures and rig as for white bass, just over brush piles that our graph showed crappie hanging in. We had a beautiful February day with really great customers. 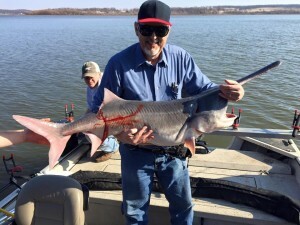 Snagging spoonbill paddlefish and catching white bass at Grand Lake in Oklahoma. 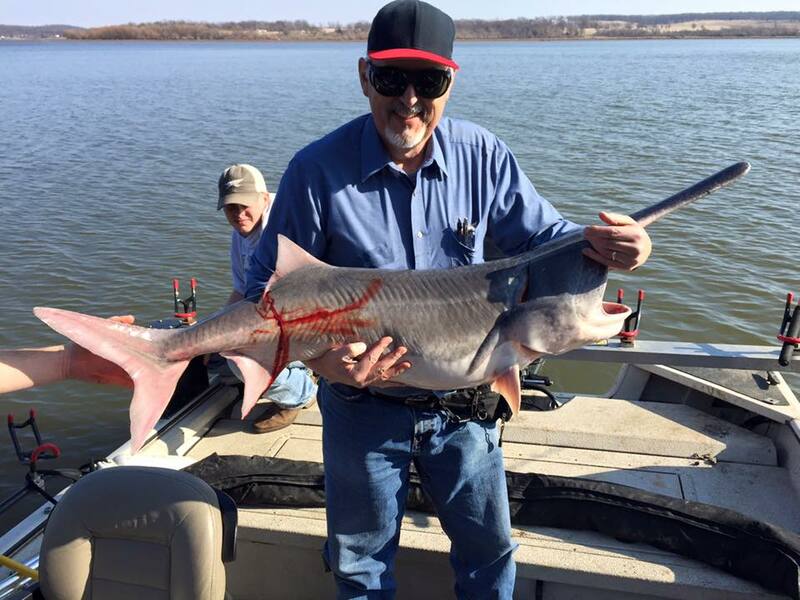 Andy and Butch brought Stan out to catch spoonbill paddlefish for his birthday. It was tough! With our recent warm weather, the fish had moved from where they were last week. We covered lots of water, marking very few spoonbill in several miles of where they usually are this time of year. Our water temps are about 12 degrees higher than last year at this same time. Crazy!!! We worked hard and got Stan on his big fish! It was a great fighter too. After our trip, we decided to head up to the Spring River above Grand Lakeand check out the white bass. We have a trip there tomorrow and wanted to get an idea for what was going on. We found fish a little scattered until about 2 hours before dark. Then it was fast action using GoGo Minnows in Chartreuse right next to the bank. We would cast it up close and slow roll it down. Fish on! 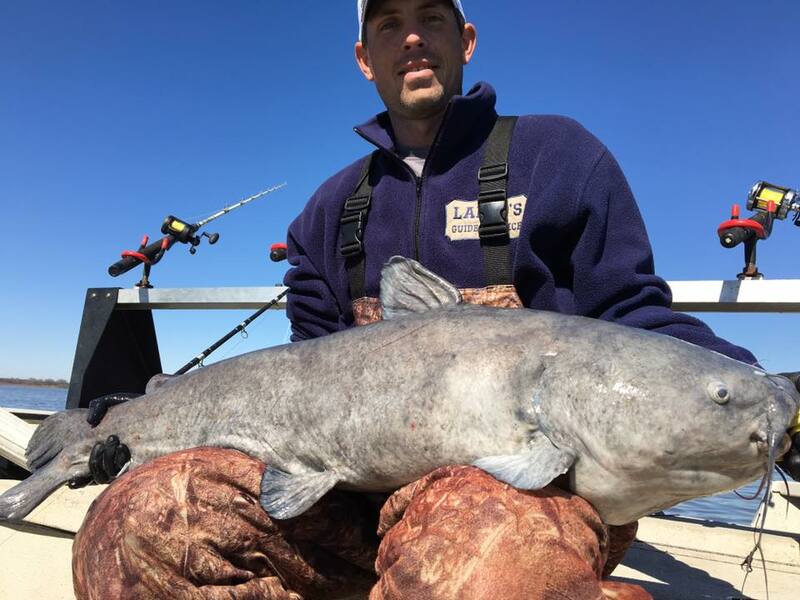 Catching shallow water blue catfish on Keystone Lake in Oklahoma with Lauren and her father getting blue catfish slime for her science fair project! Lauren is doing research for her science fair project on the properties of catfish slime. It has been a myth and proven that the belly slime from a blue catfish will lessen the sting and pain from being stuck by a fin and help heal a cut…so why?!?!?! That is what Lauren is trying to figure out. We started out the morning catching bait before our customers arrived. We got there just before sunrise and bait was easy since it was in the upper third of the water column. After about 5 throws of the net it was time to graph some areas close to the boat ramp and see what is going on. We found blue catfish and stripers hanging out on the edge of a channel edge feeding on the shad having their morning breakfast. We went shallow and marked some nice blue catfish in their also. 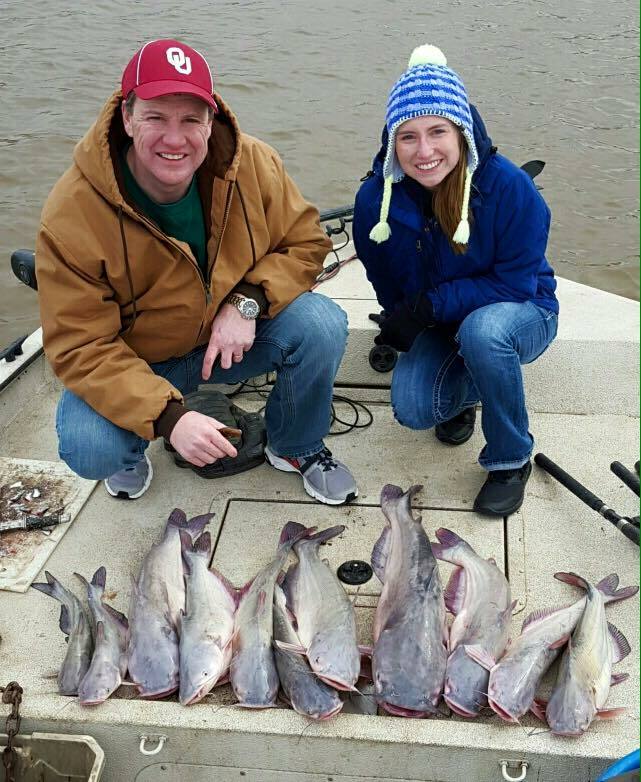 After picking up Lauren and her father, we took off to see if the blue catfish were feeding shallow. As soon as we got into water less than 8 feet deep the graph started showing blue catfish on the Lowrance side image. 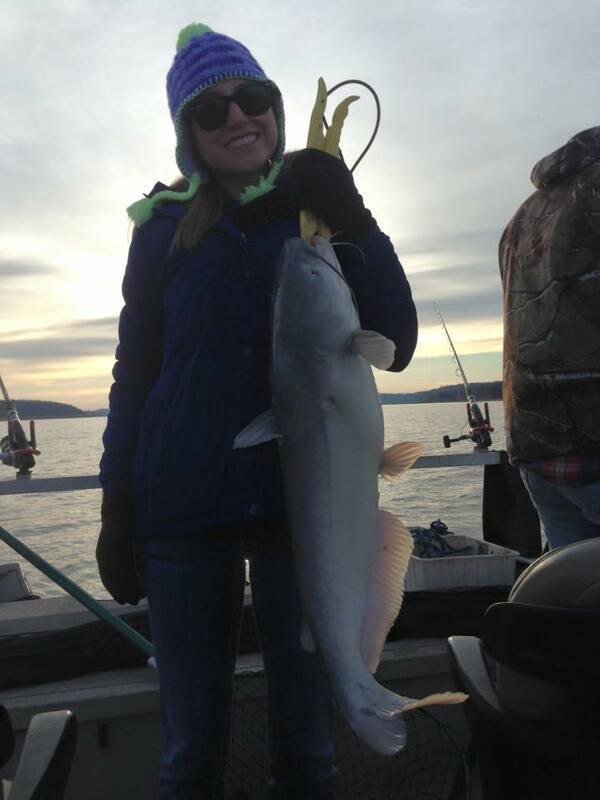 We anchored up and it was only a matter of minutes and Lauren and her father had a double on! We took samples of belly slime from ten blue catfish for research and had a blast doing it!! !